I’m really not a spring person; autumn/winter are more my kind of seasons. I like dark colours, layers and covering up. I find spring especially a tricky season in the UK because it’s either like winter or summer: there never seems to be any in-between. You can start the day with four layers on and by lunchtime, you’ve ditched three of them. Because spring is such a transitional season, I keep most of my winter items in my wardrobe and just add in a couple of summer capsule bits. 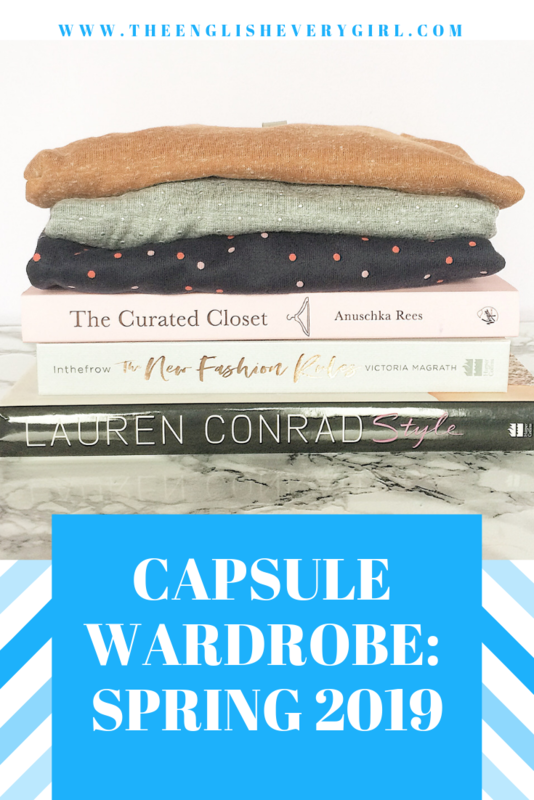 The beauty of having a capsule wardrobe is that you don’t need to spend hours getting items out of storage because you only store a few items at a time. 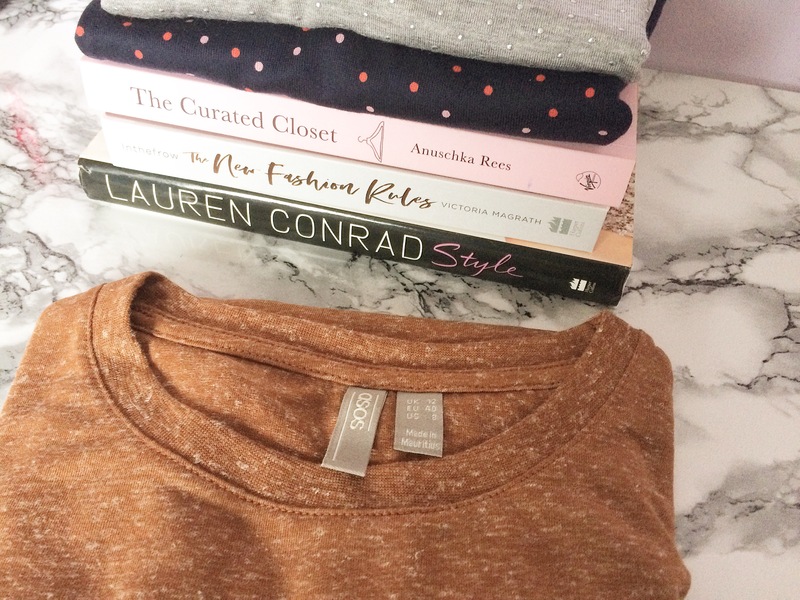 I’ve switched out my thicker jumpers into my second wardrobe and added more T-shirts/tops to my current capsule. Once again, this is not my final spring capsule. I can add pieces if I find something I love but equally, if I’m just not loving an item anymore, I can sell it. This will probably be the case with several tops this spring because I need to whittle down my collection. Recapping my winter capsule was also insightful to see what I did wrong and what I want to do for spring. Hopefully, I’ll learn my lesson! Process: My wardrobe is pretty streamline already but every 3 months, I like to re-try everything on. Tastes change, some items might be too small/big and some may be at the end of their life. I get all of my clothes out of storage and see which might be worn this season. My wardrobe is pretty standard all year round when it comes to fit and colours. I do have a few items on my wishlist but most of them are either for my summer capsule or replacements for items that don’t have long left. My wishlist is mostly focused on bottoms, shoes and outerwear because they are the areas I’m mostly lacking in. Colour palette: My standard black and grey are always the basis along with stripes and denim. I still like shades of blue, red and pink but have added in a splash of lilac, tan and white. I would experiment with colour more but it’s just not me! Lifestyle: Working from home means I can wear whatever I like. Sometimes I stay in PJs, sometimes I change into comfy clothes. If I know I need to be out, I know that I have items for any occasion. Although I tend to be a casual dresser, I like to have some pieces that can also be dressed up! I definitely want to start wearing regular clothes at home or else I’ll never wear most of my wardrobe! Weather: Ah the delightful UK springtime. It can be freezing or blazing sunshine. This is the reason I don’t include coats and certain footwear in my capsules. Outerwear, for me, is just to keep warm most of the time and because of the rain, biker boots are a must occasionally. On the other hand, when the sun comes out, I like to have some thin layers in there so I can just go out in a t-shirt or blouse. Style: For a while now, I’ve been sticking with classic, comfortable and casual. I like to dress for myself and what suits me. It’s taken a while to get to that point but I think I finally know my style. I like to have pieces in there can be dressed up and down because sometimes, a girl likes to look cute for herself! My basic uniform is a stripey top or jumper, jeans and trainers but I really want to use the spring season to experiment a little more. I’d like to keep my outfits casual but maybe a little more adult. I need to add some footwear that is polished but still comfy: I’ve got my eye looking for a pair of sleek white sneakers. I don’t really do trends but rather incorporate the ones I like into my style. I know what I like now. Budget: I didn’t set myself a budget for my spring capsule, rather picked items as and when I saw them. 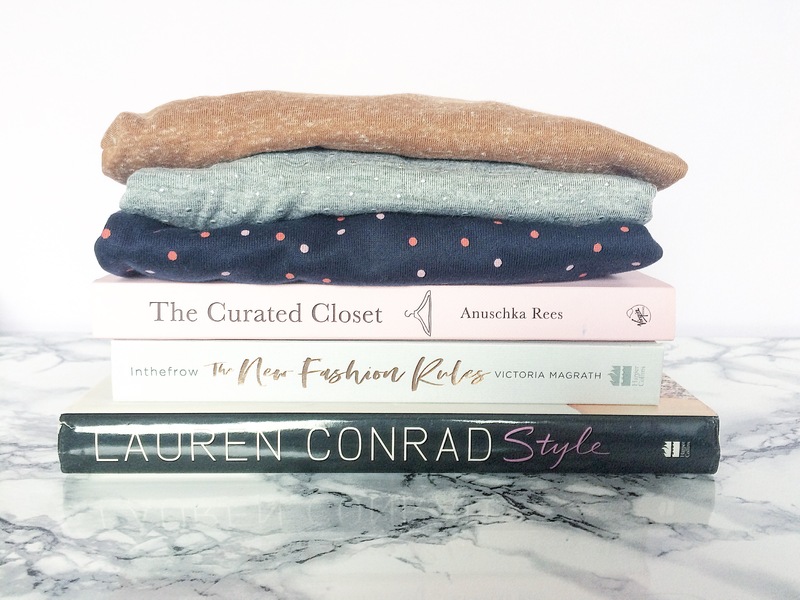 I’ve found myself spending less and less time on clothing websites and shopping on the high street just doesn’t seem as fun to me anymore. Choosing quality pieces over quantity means I have a little bit more to spend. Even when I do hauls online, I end up sending most of it back! I’m also not too strict in that if I see something I really love during the season, I can still add it to my capsule. Track my wear count: I like to create a list and mark off every time I wear an item. I stick the list on the inside of my wardrobe so I can quickly check off my outfit for the day. This way, I can make sure I wear the pieces I’ve not marked yet! I’ve also put all my clothes on pink hangers and when they’ve been washed and dried, they’ll go back onto a purple one. It’s a little more visual so you can see what you’re wearing and not. Create a summer wishlist: I have very few summer items so I know I will need to spend a lot more for my next capsule. I’m not really a summer person so always struggle when it comes to finding items to wear. I think I’d like to incorporate more white into my wardrobe and tans/beiges so I can substitute some black! I’ll also be on the hunt for any autumn bargains, just because they can be the more expensive items like boots and jackets! 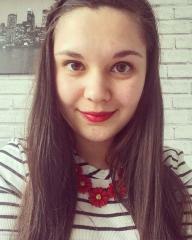 Continue to sell old clothes online: At the start of the year, I had a huge wardrobe clearout but there is just so much to sell. I have half a wardrobe full plus a large suitcase and a plastic box but if I do it in stages, it’s less stressful! However much I sell, that can be my budget for my summer capsule. Research more into sustainable brands: Because I am buying less, I can spend more per item. I’d like to start buying from more ethical brands, rather than your regular stores. I’ve found myself actually a little bored of the high street stores and visit the same few every time. Bottoms: I very rarely get my legs out unless it is absolutely roasting. I’ll save all my shorts for my summer capsule but because I have a fluid capsule, I can grab them if it does get hot. I always reach for jeans but recently, I’ve been grabbing my boyfriend jeans more than my skinnies. I also like to have a smart pair of bottoms in there for meetings and dressier events. I don’t bother with skirts or dresses anymore because I never wear them! Outerwear: Although I don’t include coats, I do include the layers underneath which tend to be thinner and some thinner jackets. Cardigans and bomber jackets make great layering pieces and I am definitely looking to change up my current collection. I have what I need but they are all older pieces and won’t last forever. Shoes: I keep my shoes as neutral as possible because then I know they match everything. I only really buy boots, trainers and ballet flats/loafers. My feet can’t hack heels anymore so I compromise with heeled boots. My rule of footwear is they have to be comfortable and I have to be able to wear them for at least a couple of hours before they hurt. I could do with adding to my flats collection though and have my eye on some pink loafers this season. Tops: I’ve still included some long-sleeved tops and thin jumpers, just because I know how cold I can get! Whether I wear them remains to be seen but they’re there if I do need them. The majority of my capsule is T-shirts with a few dressier tops there too. Because I gravitate towards casual styles, there are a few slogan T-shirts in there but they’re a lot more subtle than I’ve had previously. I think my style is definitely maturing so I’m always conscious of this when adding new pieces. 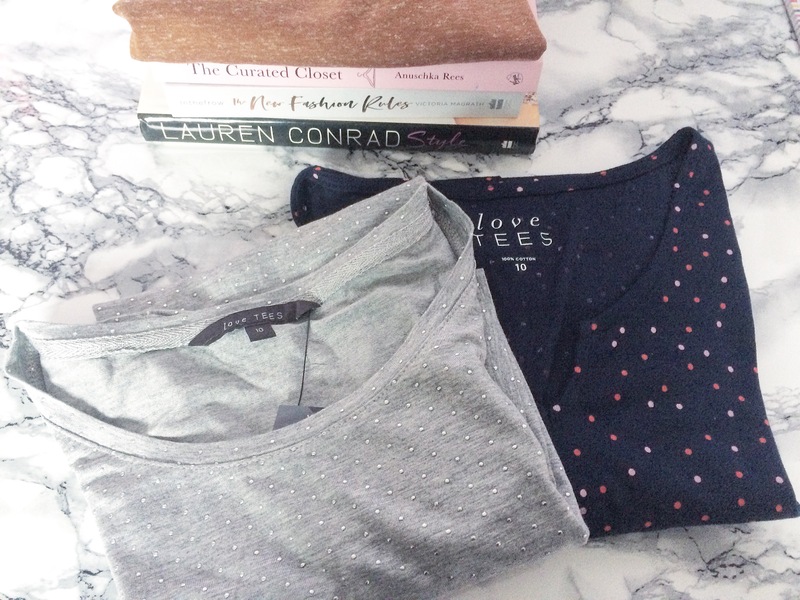 Total spend = £23.26 for 3 tops = bargain! More Bonmarche additions! I also bought another four items in that order but returned them. I knew I didn’t want to add too many pieces because I want to explore my own wardrobe a little more and see which combinations I put together frequently. However, when I saw the ASOS top, that was exactly what I’ve been looking for! I just wish they sold it in other colours too as the material is so soft. I may add more pieces throughout the season but the plan is to buy as little as possible. I know I have nine items that may not last the whole season because they are just about dying! It’s a shame because one of those items are my favourite pair of jeans. They’re just starting to fade around the inner thighs and will probably have a hole in them after the next couple of wears! However, instead of being sad, I’m happy that they’ve served me well in the past couple of years and they were definitely worth the £40 I paid for them. And there you have it: my spring capsule wardrobe is underway. I can’t wait to start experimenting and mixing and matching pieces together that I wouldn’t usually put in one outfit. Will I add any more pieces? Who knows? 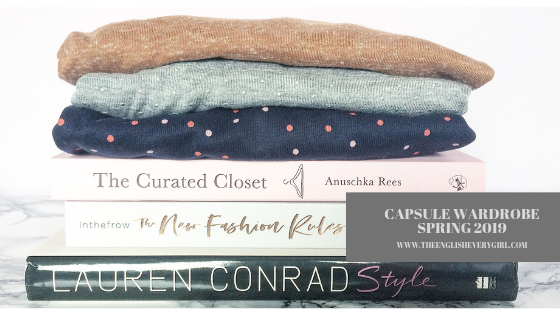 Are you a capsule wardrobe convert? What are your must-haves for spring? Let me know!